I am indeed happy to be amidst you this morning on the occasion of the eighth annual convention of Central Information Commission. This is an important occasion to reflect and introspect about how RTI has impacted on the functioning of the government and citizens. The Right to Information Act was enacted to secure access to information held by and under the control of government and public authorities in order to promote transparency and accountability in the functioning of the public authority. It seeks to establish accountable and responsible governance and is a mechanism to create a better balance in the equation of power between those who hold and control information and the citizen who is both the author and beneficiary of democracy. I call upon all stakeholders to use the occasion of this Convention to deliberate on issues of abiding interest in the areas of Transparency, Accountability and Good Governance. I am glad this Convention is also being attended by experts from the FICCI, CII and the ASSOCHAM, who would be discussing the commitment and the responsibilities of the corporate and the private sectors in respect of the dissemination of certain basic information relating to their operations. Such deliberations would strengthen the trust culture in all walks of governance, including the private and public sector. I am also happy to know that discussions will be held this year on core areas of RTI vis-a-vis inclusive growth, RTI an anti-corruption tool and Media and RTI. I hope the Convention will come up with new ideas that can improve the implementation of the RTI Act. I understand there has been a significant growth in the demand for information by our people in the last eight years. The Commission, through its decisions, has laid down basic principles for disclosure of various classes of information which were not considered fit for disclosure so far. I am told that the rejection of the requested information has consistently shown a decreasing trend from 7.2% in 2007-08 to 6.4% in 2009-10 and 5.2% in 2010-11. However the rejection percentage in 2012-13 went up to 7.7%. The fact that the growth of Appeals and Complaints with the Commission is showing a decreasing rate in percentage terms confirms the notion that quality proactive disclosure and better training of the CPIOs and Appellate Authorities reduces the rejection level. A large number of appeals/complaints before the Commission, however, are also indicative of the need for enhancement in the quality of voluntary disclosure so that information seekers are not required to join long queues. Public Authorities in our country must be proactive and voluntarily put information in the public domain for the use of citizens. The Department of Personnel and Training, Government of India, in April, 2013, has issued detailed guidelines regarding implementation of proactive disclosure obligations of the Ministry/Departments and public authorities under their jurisdiction. It envisages designating one of the senior officers, not below the rank of Joint Secretary of the Ministry/Departments, as nodal officer with a view to overseeing implementation of obligations under Section 4 of the Act by public authorities and to apprise the top management and the Central Information Commission of its progress. This has been a long standing demand of large number of civil society organisations. Through this circular the Central Government has expanded the scope of proactive disclosures and has included inter alia, CAG and PAC audit paras, PPPs, information relating to procurements, foreign tours of senior government functionaries etc. subject to the provisions of section 8 of the RTI Act. This circular requires the Ministry/Departments/Public Authorities to make their proactive disclosures audited by the third party and report them to the Government of India and to the Central Information Commission. Such information placed on a common portal would go a long way in improving monitoring and reporting procedures. It is also heartening that Department of Personnel & Training has recently launched a portal enabling the citizens to file RTI applications and first appeals online along with formalities to make payments for release of information from large number of information seekers. 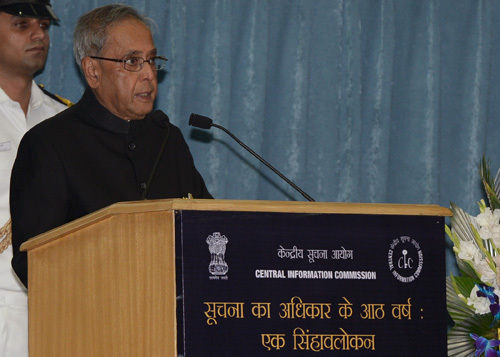 The Central Information Commission (CIC) combines within itself the role of a regulator, adjudicator and advisor implementing the Right to Information Act. It has been actively working with the Planning Commission to build in disclosure obligations in the Public Private Partnership arrangements. At its initiative, a message on RTI is going to be printed on the cover pages of all NCERT school books. These initiatives are commendable and I compliment the members and staff of the CIC on having done a good job so far. Similarly, our enthusiasm about transparency and democracy should not make us ignore, even for a moment, the fact that the citizen who is at the heart of all these arrangements is also an individual with certain inviolable rights to privacy. There is a wafer thin difference between what is public and what is private. The RTI Act has provisions which deal with such issues, but there are certain areas which need further clarity. There is perhaps need to create an arrangement that will provide protection to individuals in case their privacy is breached through unlawful means. A major challenge for public authorities is ‘Information Housekeeping’. With the improvement in data management practices and by computerization of records and work flow, citizens should be able to locate on their own the status of their requests in the work flow artery of public authorities. The RTI Act itself mandates such Disclosure and Record Management in Section 4. We must be able to effectively use information communication technologies (ICTs) to strengthen the implementation of the RTI Act. The experience of first eight years of the RTI is that it is an important instrument of improving governance. The RTI Act must not be seen as a zero sum game between the citizen and Public Authorities. Governance in a democracy is all about fiduciary and trust and the level of a trust between the citizen and the government is one of the best indicators of mature democracy. The Government must do everything possible to create an informed citizenry which is vital for the functioning of our democracy. I wish the participants of this Convention the very best and am confident that their deliberations will be highly successful.